We all love zombies. Alright, some of us don't love them, but the desire to mow down zombie hordes is nigh universal. With last year's Left 4 Dead, the zombie co-op survival genre was born, and was quickly reinforced by Call of Duty: World at War's Nazi Zombies mode. 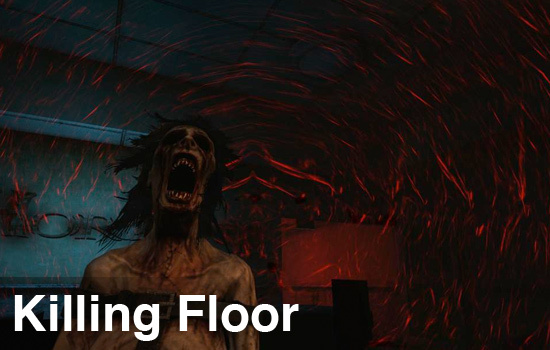 Killing Floor, from Tripwire Interactive, liberally borrows elements from both of these games and a few others to create a wonderful co-op experience that feels instantly familiar, but becomes unique almost from the moment you take control. With co-op for up to six players being the game's entire focus (its subtitle is "Co-Op Survival Horror", after all), genre (and co-op) fans are in for a real treat. Structured similar to modes such as Horde from Gears of War 2, players find themselves dropped into extremely large environments and are soon beset by ever-increasing waves of nasty enemies. The maps are full of well thought out choke points, secret areas and wide-open spaces. As you are chased around the levels, players can slam doors shut behind them and weld the locks shut, giving a few precious moments of reprieve to try and gain the upper hand. As you play, your performance earns you cash to spend at a trader NPC who opens up shop at random locations between rounds. In a complete stroke of brilliance, the game indicates where the trader will be with both a compass (during play) and a breadcrumb trail (between rounds), so you can lure enemies closer to where the trader will be. The purpose of this trader is twofold. First, it allows you to restock ammo, purchase more powerful weapons and supplies, but the real trick is that finding where she hides forces you to move through the level, effectively training you to remember where key locations in the maps are. In addition to the core mechanics, before each game you pick a class (called "perks" here) which determines what special weapons you'll be able to use as you find/acquire them. The perks also give standard bonuses to weapon types or items (for instance, the Medic perk lets you heal more often), but each perk has five levels to acquire. You'll start earning some interesting new abilities, such as being able to see stealthed enemies from afar or seeing lifebars on all of the enemies. Since the perks are all fairly homogeneous to start, I would recommend new players pick a style and level it up so their role will be a little more defined. 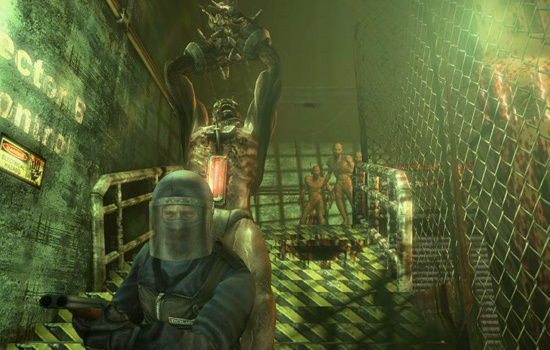 The final round of each map presents the player with an enemy called the Patriarch, which, similar to the L4D tank, takes an extreme amount of coordination to fight. He can spawn more enemies, stealth and even run off to heal himself, so players will need to effectively make use of their perk bonuses to take care of each other and keep track of what the Patriarch is up to at any given moment. In playtests, my squads were never able to defeat him, which was frustrating, especially since a complete wipe ends your session and cycles to the next map in the server playlist. What really sets Killing Floor apart from its progenitors is a carefully balanced shift towards being a more realistic shooter. The fact this game is developed by the same minds that brought us Red Orchestra should please those who don't want their gunplay to feel arcade-like. First off, you don't get a crosshair to use as a crutch- if you want accurate firing you're going to need to bring up the iron sights. While this initially leads to moments of extreme tension, as you become more accustomed to how to best distance yourself from the horde and thin it out, the game becomes extremely fluid. You've also got to deal with encumbrance. Yes, how much (and what) you're carrying will affect your run speed and ability to pick up or purchase new gear. All in all, Killing Floor is an outstanding experience that proudly wears its influences on its sleeve. While minor complaints exist, particularly regarding the difficulty curve of the final round, I wholeheartedly recommend it to anyone looking for a solid zombie game, co-op experience or a way to spend $20. The Co-Op Experience: Fight side by side through this action horror title. Page created in 0.3473 seconds.